Best4Video DVD Copy is a powerful all-in-one solution for copying, backing up, ripping, and burning any DVDs. With the help of this potent tool you will easily backup your DVD to PC or create 1:1 copy of it. 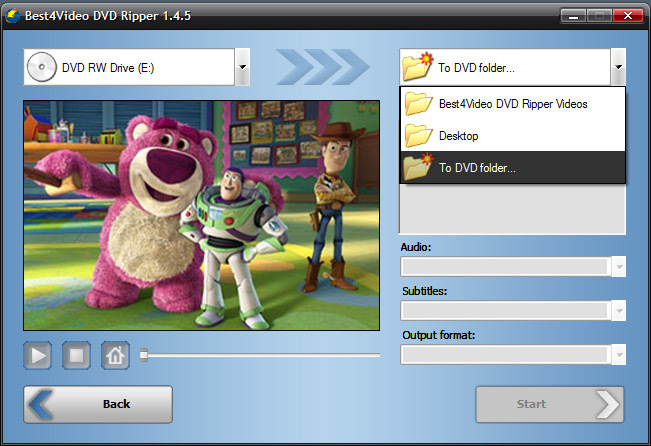 Best4Video DVD Copy offers you an easy way to backup your whole DVD collection to PC or create DVD copies of your favorite movies, as well as copy DVD video to iPod or iPhone and enjoy it wherever you want. Best4Video DVD Copy has high performance capabilities and at the same time is very easy to use. It was created to provide best results with minimum time and effort expenditure. With its help you will be able to backup your DVD movies preserving almost the same quality at only 10% of space and use those videos in compliance with your own needs and preferences. Support of both protected and non-protected DVDs. Even if your DVD is DRM-protected, Best4Video DVD Copy will create a non-protected copy without and playback limitations. Customizable settings. You can manage video, audio, and subtitles settings, select output format and much more. Handy interface. Clear and intuitive user interface provides fast and convenient access to all functions of the program. Perfect quality. Best4Video DVD Copy provides near original video quality using only 10% of the original video size or creates 1:1 DVD copies according to your own preferences. Fast speed. All DVD copying procedures are made with the highest possible speed, thus significantly saving your time. Best4Video DVD Copy is a flawless multifunctional software able to perform any DVD copying actions in the fastest and the most convenient way. With its help you will create perfect quality copies of your entire DVD collection quickly and easily, thus saving your time for enjoying favorite movies, with no more reason to worry about your DVDs' loss or damage. Want to convert your video quick and with high quality? 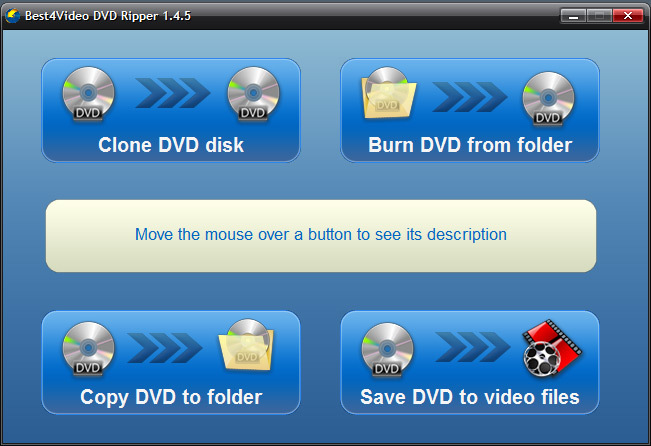 In this case you need DVD Ripper software tool. Stop thinking in the ends. Get it right now!